Moschino will launch Cheap and Chic Stars, a new fragrance for women from the brand's youth-oriented Cheap and Chic label, later this month. Cheap and Chic Stars is the first Moschino fragrance under new creative director Jeremy Scott. It was developed by perfumer Alexandra Kosinski; the notes include citron granita, rose, peony, lily of the valley, orange blossom, jasmine, driftwood, vetiver and ambroxan. 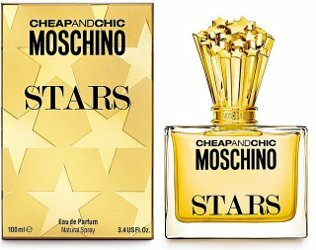 Moschino Cheap and Chic Stars will be available in 30, 50 and 100 ml Eau de Parfum. I didn’t realize Moschino was still making fragrances. They never seem to show up in Canada, or maybe I just don’t notice them. At least (according to Basenotes) they’re only doing about one a year, which in these days shows admirable restraint. I sure do like that bottle, which looks like fireworks are shooting out of it. About a year ago Winners was overflowing with them.